As the warm weather shows no real sign of abating, are you starting to tire of summer salads? 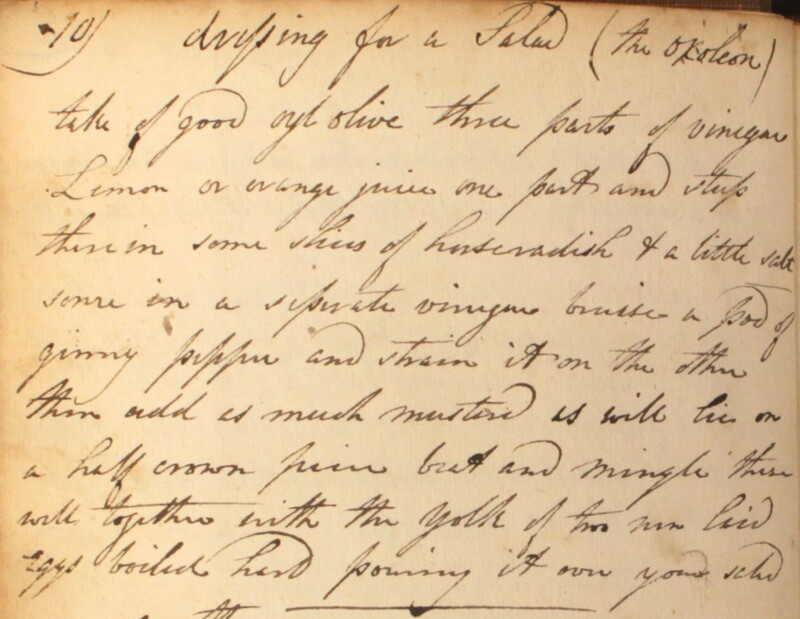 Today’s three recipes, taken from Dr Kitchiner’s Cook’s Oracle, offer Regency-era tips for giving your lettuce an extra lease of life. Take a good oyl olive, three parts of vinegar, lemon or orange juice one part, and steep them in some skins of horseradish & a little salt. Some in a separate vinegar. Bruise a pod of ginny pepper and strain it on the other. Then add as much mustard as will lie on a half crown piece. Beat and mingle these well together with the yolks of two new laid eggs boiled hard, pouring it over your salad. A Salad or Sauce for Cold Meat, Fish &c.
This dressing with mustard and cream is the most indulgent out of the three. Any surprise that it’s our favourite? Boil a couple of eggs twelve minutes. Rub the yolks (when quite cold) through a sieve with a wooden spoon and mix them with a tablespoonful of cream, then add two of oil or melted butter. When well mixed, add by degrees a teaspoonful of salt or powdered lump sugar and the same of made mustard. When united, add three tablespl. of vinegar. Garnish with white of egg. 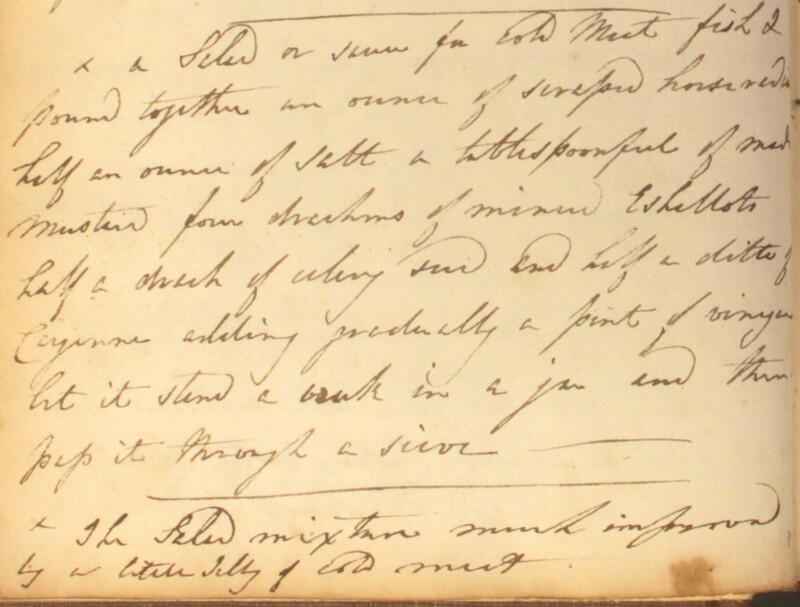 This entry was posted in Cookbook recipes, Sauces and dressings (C19th) and tagged 19th century cookery, Cook's Oracle, dressing, John Evelyn, oil, salad, vinaigrette, vinegar, William Kitchiner. Bookmark the permalink. It’s interesting that the last recipe gives the option of a teaspoonful of salt OR sugar, which I imagine would change the taste significantly. Yet they seem to be given equal weight in the recipe. Guinea pepper is more likely to be meleguetta pepper, aka grains of paradise, an African spice, relative of cardamon which comes in pods. 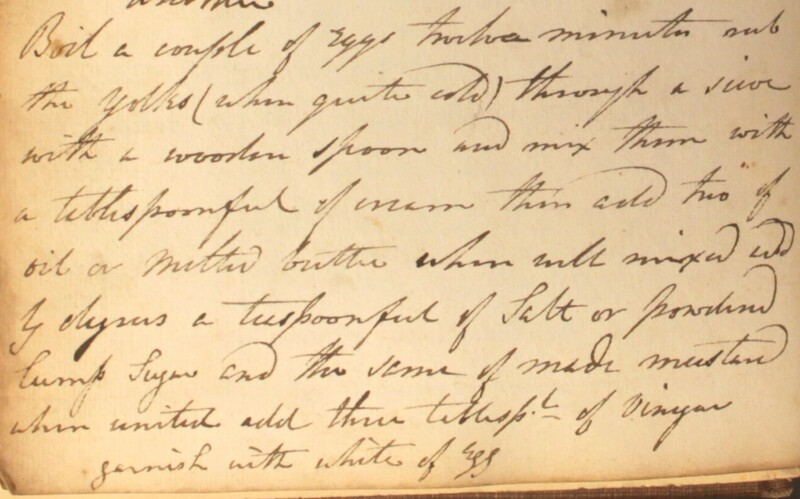 GoP use starts to tail off in recipe books in the 17th&18thC along with things like long pepper but both can still be found listed on druggist and spice merchant lists well into the 19thC. Thanks for letting us know about the Grains of Paradise, Grymm, and it’s interesting that it’s still possible to get hold of this spice in London – a really great tip!